I did not cast anything on during the opening ceremony. I did not knit a stitch on any project for the entire first week of the Olympics. During the second week, I attempted to reinforce the button bands for the Tangled Yoke Cardigan. The US men’s curling team had more success than I did. Finally, I cast on a small project. It’s not a gold-medal contender, but I think it’ll be a crowd-pleaser in our host nation. 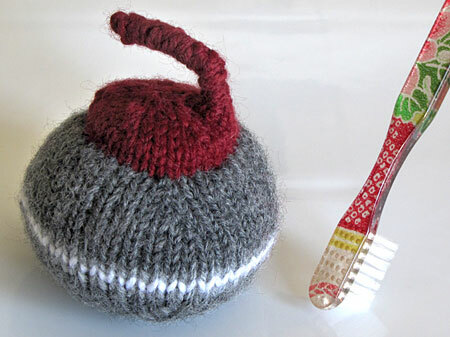 Maybe I should have knit a hockey puck instead. Congrats, Canadians! It was an awesome Olympics. CogKnition posted this on February 28th, 2010 @ 7:54pm in Toys | Permalink to "An Olympic Triumph"
oh, I luvitt! One of your best designs ever. It’s a beaut, eh! Well done.